Even though this year spring has been slow coming and the temperatures at the moment remind us more of winter, the bird song outside the window early in the morning is unmistakably spring-like. Spring is the time when even bears wake up from their winter slumber, so it is a good time to fine tune our bodies and nurture our skin and what can be better than focussing on the skincare cleansing ritual? Say hello to AS Apothecary Complete Box of Cleansing! In early February I took a train to Lewes, where Amanda Saurin, founder and creator of AS Apothecary lives. After several awe-inspiring hours in Amanda’s company ( more of this soon in a separate post ! ), Amanda indulged me in her new product set, called Complete Box of Cleansing, as my parting gift, which I took home with a childishly excited grin on my face. Having said that, I held off using the kit until later that month, when flowers started blooming and I felt ready to change my skincare ritual and indulge my skin and the senses. The design of the box itself reminded me of Japanese tea art form and precision. Precision of lines of this A4-sized black box doesn’t shout ‘pick me up’, rather it whispers gently, like the spring wind ‘come and have a look at what I hide inside’. Amanda is a very unique creative woman, who grows and gathers plants and uses her vast apothecary skills, fusing herbs and knowledge of homeopathy to create effective, gentle, bespoke products that nurture your skin and calm your mind, opening your eyes to the magic and wonder of nature. The box itself contains five items: Mineral Powder No.2 to cleanse and invigorate, Cleansing Oil No.5 to sooth and restore, Geranium Cleansing Water No.3 to balance & regulate, a cotton Cleansing Cloth to gently exfoliate and sooth and a Ceramic Spoon & a Ceramic Bowl handmade in Sussex. ASA Complete Box of Cleansing is suitable for all skin types & brings together a ritual for you to experience daily, by combining the very best of mountain, land and sea – ‘it is a celebration of the healing power of the landscape from our travels through the mountains of the Levant, the rolling Sussex countryside and the clear turquoise waters of the Atlantic Ocean off the Isle of Harris in the Outer Hebrides. Every ingredient is thoughtfully and consciously chosen for its skin cleansing, healing, brightening and invigorating properties. The scent of each product is arresting, captivating and deeply delicious from the earthy Mineral Powder, through the comforting, rich Cleansing oil to the fresh Geranium Cleansing Water’. I was lucky to spend time in Amanda’s creative hub, her temporary studio, as the roof was being fixed in her original studio in February and to experience the scents of the oils that she makes and examine the plant oils that Amanda creates and works with – most of them made me question the look and smell of the oils that we routinely buy in various retailers. Plants that are nurtured by hand or wild-harvested have the unmistakable look and smell that takes you, as consumer, on a fascinating journey of rediscovery and appreciation of the power of nature, elements and plants and herbs. Through this box we invite you to join us in the essential alchemy of mixing your own exfoliator and face mask using products perfected for maximum effect and to rekindle the enjoyment of long forgotten play. – 10mls of Cleansing oil: made from a combination of essential oils to clean, sooth brighten and nourish your skin. Amanda chose Borage oil and her own Calendula and Rosehip oils for this product, to help restore skin’s moisture levels, as well as repair dry skin. She also included Jojoba oil to regulate sebum production, reduce pore size and sooth. Pale yellow in colour, it has the uplifting smell of vibrant flower glory and makes cleansing a joyful pleasure, letting your fingers glide of the canvas of your skin, not dragging it. Instead you enjoy the self-administered facial massage and untangling the muscles tension, release the toxins that might be stuck around the jawline. This oil also nurtures and moisturises your skin, so when you clear it off the face with the gentle cleansing cloth, your skin doesn’t feel dry like a raisin but perfectly primed for further skincare ritual. 10mls of Geranium Cleansing Water is the glorious mixture of Amanda’s Geraniums grown in Cyprus & distilled in Sussex ( used in herbalism to help balance hormones; Cyprus geraniums are rich in volatiles and have a heady, potent smell, while Sussex geraniums are mildly gentle ) enhanced by Witchhazel to clear blemishes. Amanda created this product to help those who are prone to acne and hormonal breakouts that unfortunately now affect many women of various ages, not just teenagers. It is somewhat hard to describe the texture of this product, as it is light, like water from a forest natural spring, but it also has the ‘springiness’, so I like to dispense a few drops with a pipette into the clean palm of my hand and gently pat it in to my face. It sinks in immediately, adding a subtle veil of radiance to the skin. 15g Mineral Powder full of the skin enhancing flowers and herbs Amanda grows or gets from her trusted suppliers, Scottish clay to draw out impurities and the magical Sugar Kelp seaweed Amanda adores, finished with a tiny bit of pure medicinal grade Sandalwood to heal. It is utterly divine and so very good for the skin leaving it soft, calm and gently exfoliated. When you use and mix it yourself with cleansing water ( to make a mask ) or with cleansing oil to gently, but effectively exfoliate your skin and remove dead skin cells, you feel like an alchemist in the privacy of your own bathroom – and positive emotions we experience during nurturing rituals like that have a positive impact on our mindset, especially before we enter the land of Morpheus. Daily self-care is so vital to women, who daily nurture and care for others, often forgetting themselves! Please take the time to have some ‘me-time’ daily, as in order to look after others, you need to nurture yourself first. 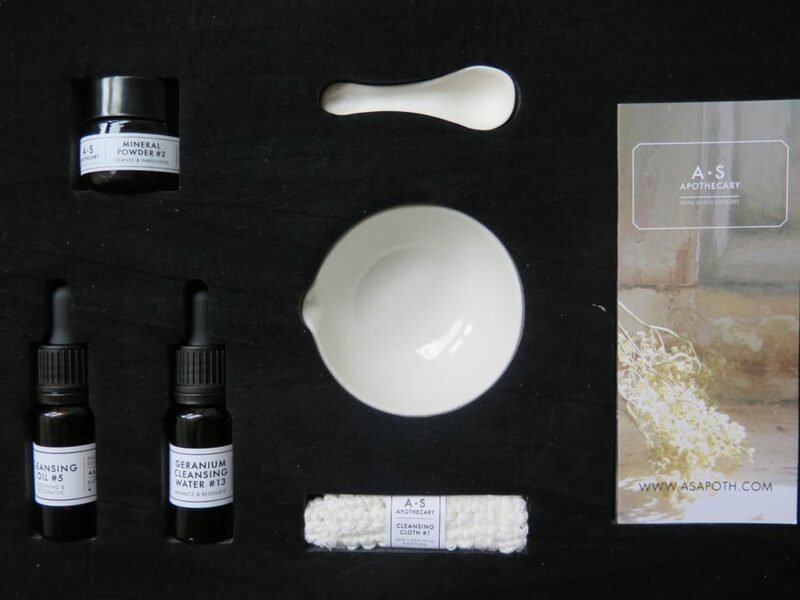 Amanda also thoughtfully enclosed a gorgeous leaflet to guide you through each of the products and explain how to make the very best use of each, taking your skin from oil cleansing, to toning, exfoliating and mask making to blissful state of mind. This box makes a beautiful gift for yourself or someone you love or whose presence in your life you value – it allows to slow down time, look at yourself in the mirror, smile and take time to nurture your skin, your mind, you soul – a secret to being in balance with yourself and being the woman that you are.